This is a fascinating tour joining a high variety of nature and cultural heritage of Polish, Czech and German inhabitants who once lived in this area. It leads along the Polish - Czech border that once divided the province of Silesia. 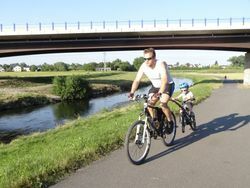 This cycle tour has become even more interesting ever since both countries joined the Schengen Agreement. Many old roads have finally opened again and the attractions along the border are easy and quick to reach by cycle. The course of the border itself is a quirk of history, cutting through the villages apparently at random as a result of an 18th century dispute between Frederick the Great of Prussia and Empress Maria Theresa of Austria. It is not an accident that Joseph Freiherr von Eichendorff, known as the greatest of the German Romantic poets, has been named patron of this tour. He was born at Lubowice Palace at Raciborz and after many years abroad returned to Silesia shortly before his death. The tour takes us along many historical buildings and memorials to the poet and his times. Day 1 (Saturday): Arrival in the Silesian capital of Wroclaw and accommodation in a centrally located hotel.It is possible to book your first as well as final night in Krakow particularly if you are going to be participating in one of our other cycle tours as well. The price will be not change and the details regarding the outward and return journeys can be discussed individually. We travel by bus through lower Silesia (about 3 hours) until the Czech border to the ski village of Zieleniec with views of the table mountains typical for this region. Zieleniec at 860 m was, as it happens, once Prussia's highest village. After visiting the extended raised bog situated on the watershed dividing the North Sea and the Baltic Sea, we cycle downhill towards Dusznik, one of the oldest and most famous of the Sudeten spa resorts. Then we cycle along the Bystrzyca, a mountain stream, through quiet alleys to reach the picturesque spa resort of Polanica Zdroj. Finally we cycle downhill to the valley of the Nysa Klodzka River to reach our hotel in Klodzko. Klodzko is a cultural centre of the region and is also known for its attractive location, the many monuments and places of interest. These include above all a fortress from the 18th century and a Gothic bridge known as the younger sister of the Karlsbridge of Prague. We then cycle past dreamy villages and go downhill along the deep valley of Nysa Klodzka towards Bardo, a popular place of pilgrimage with one of Silesia's most important Mother Mary Sanctuaries. 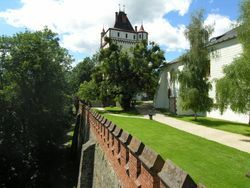 We ride down winding cycle paths through narrow alleys with fruit trees until we come to the impressive castle of Kamieniec Zabkowicki, an eccentric idea of the renowned architect Karl Friedrich Schinkel. Finally we follow the Nysa Klodzka to get to the historical city of Paczkow. We visit the old town of Paczkow, with almost completely preserved city walls from the 14th century earning it the sobriquet, the "Polish Carcassonne" referring to the famous fortified historical French city. We then leave the Polish part of Silesia and cross the Polish-Czech border and check into our rooms in Javornik. In the morning we visit the Jansky Vrch castle in Javornik. This castle dates from the 13th century and was modified into a palace during the Barok period. 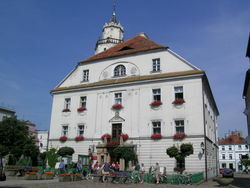 It established itself as a centre for Silesian music during this time. 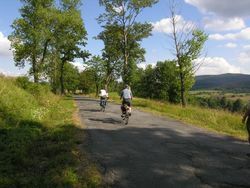 Following the visit we cycle along the border through the villages of Bohemia. At Vidnava we cross over the border again and check into our hotel, in Glucholazy at the centre of a landscaped park. The market square with its renaissance and Barok houses is very attractive and has a Linden tree planted in 1648 in remembrance of the end of the Thirty Years' War. Stone crosses and shrines on the roadside are a common occurrence on this leg. These marked the pilgrim routes in earlier days and are still often seen in the Sudeten region. We will be travelling over smalls roads via Prudnik to the Czech village of Osoblaha. German author Otfried Preussler named his main figure, Robber Hotzenplotz, in a children's book after the German version of this village's name. We will visit a well kept Jewish cemetery there. 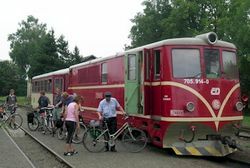 For the next part of the journey we will be taking the narrow-gauge railway that is still a common sight in these parts and will finally continue on further along the River Opava valley heading back to our hotel in Krnov. This beautiful old town has many Jugendstil buildings that were recently renovated. From Krnov we first ride southwards towards a hill with a pilgrimage church and a neo-Gothic look-out tower and then downwards through the Moravian region back into the Opava valley. The highlight of this leg will be the visit to the city of Opava, the historical capital of Czech Silesia. We stay in a hotel located directly in the heart of the old town. We then bid the Sudeten region adieu and cycle northwards to Kraware Palace built in the 17th century, which was for a long time the seat of the aristocratic von Eichendorff family. We then get off beyond the border at Krzanowice, where it is time for the return journey towards Wroclaw (or Krakow as the case may be). Departure or individual extension of stay. We first ride downhill quite a bit to the river valleys of the Weistritz and Nysa Klodzka. This is followed by the flat to undulating Sudetic foreland. There are some climbs once in a while during one of the days, however, the climb will not be more than 30-50 m with a maximum incline of 5-7 %. About 70% of the stretch is on small asphalt roads and the rest is on country roads and dirt roads. We generally use the narrow curving country roads bordered by beautiful old trees or forest roads with very few cars and at times the cycle tracks are completely off limits to road traffic. Journey to Wroclaw or Krakow, entry fees, guided tours, private payments such as other meals, drinks and tips.